So How Are Your Reading Interventions Working? Schools and school districts spend a lot of money on interventions designed to help students who have difficulty learning to read or write become more proficient in a short amount of time. This is the goal: to close the achievement gap. But how well are you implementing your interventions, and how often are you monitoring data on these students to be sure that what you are doing works for them? In Literacy Collaborative we talk about Fidelity of Implementation. Usually it is in terms of your implementation of the LC model: leadership team, effective classroom teaching supported by ongoing professional development and coaching, shared leadership, data monitoring, and then…intervention. On the Fidelity of Implementation document we ask you to consider what you are doing for reading and writing interventions and how those interventions are working. What is the payoff for your students? 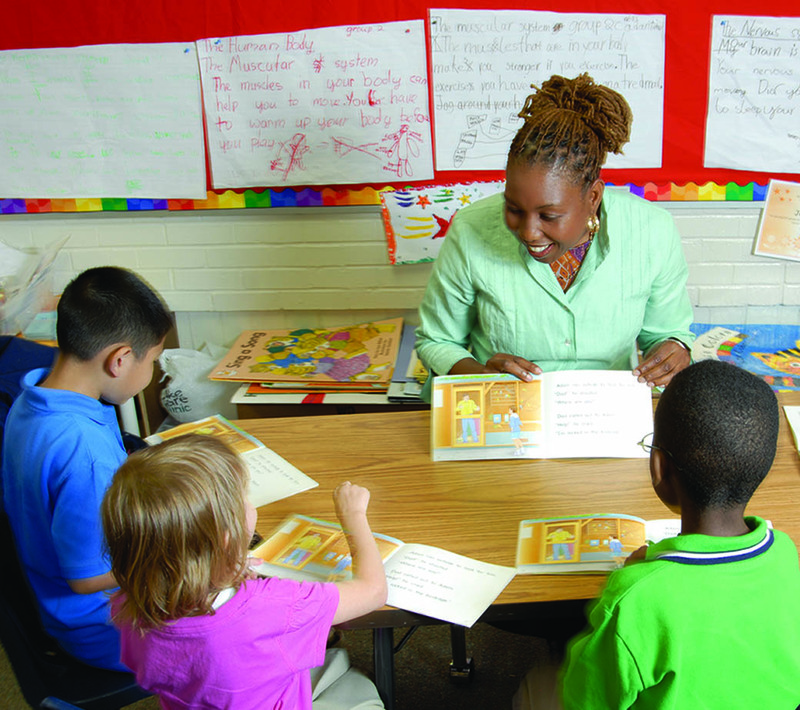 If you have Reading Recovery in your school as your Tier 3 intervention, there are already built-in processes to help Reading Recovery teachers monitor their work with students. Each day they review what happened in the lesson, take a running record of a book that was introduced the day before, and make plans for where to take the student next. These teachers keep track of each student’s performance on a daily basis, and enter it annually into the national IDEC database. Each year these statistics are reviewed and an annual report is published on the successes and challenges related to Reading Recovery student achievement. It is incumbent on each school to scrutinize their Reading Recovery teaching and data with the same rigor. In this way, the school is ensuring that students get targeted instruction that conforms to the national standards. That is the only way students who are in the bottom 20-25% of their class can possibly hope to not only catch up to the average students in their grade, but sometimes surpass them…and continue to thrive as they move up through the grades. 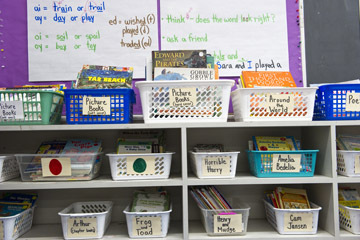 What about Leveled Literacy Intervention? In order to implement this small group intervention with fidelity, lessons should be thirty to forty-five minutes long (depending on the level), and the LLI teacher should meet with students daily. 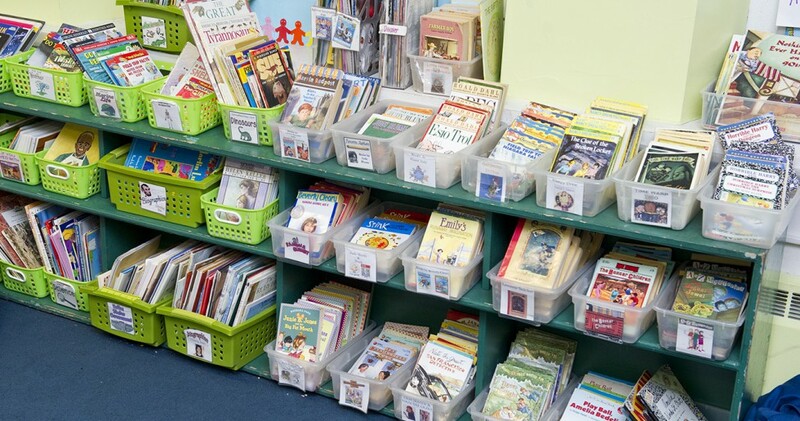 Just as in Reading Recovery, frequent assessment assures that the students are working at their growing edge, and that the time spent on this intensive intervention has pay-offs when students meet or exceed the reading performance of their on-grade-level peers. Schools that have invested in training LLI teachers and in materials to support the intervention then need to insure that the intervention is administered with fidelity. LLI students have been identified as needing help to succeed with reading and writing. If they do not receive the intervention as designed, then schools are compromising the ability of these students to make the big gains necessary to close the gap between them and their on-grade-level peers. Intervention is about hard, targeted teaching designed to make swift achievement gains. What can your school leadership team do to insure that interventions are administered as designed? Time: is the time you have allotted for your interventionists to work with students adequate? Can they meet with students five days a week for the prescribed amount of time? Do they have adequate time between lessons to reflect on their teaching and record data? If time is tight, how might you stretch it? Training and Monitoring: Have interventionists received adequate training in how to use materials and monitor data? Do they engage with ongoing professional development to keep their teaching skills sharp? Do they meet with other interventionists in the district to share experiences and problem-solve dilemmas? Data analysis: Do interventionists have time to analyze data and meet with literacy teams to problem-solve when students are not making adequate progress? How frequently does this happen? Reading Recovery and LLI are short-term interventions. If students are not progressing after ten to fifteen lessons, another pair of eyes and ears might help to make shifts in the teaching that will help students be more successful. What procedures are in place to re-evaluate instruction that is not working and support interventionists who might need help in analyzing their work? Team work: Do the administrators, classroom teachers, interventionists, and literacy coaches work as a team to develop intervention plans and monitor them for success? Does the administrator support the interventionists with time, space, materials, and ongoing professional development opportunities? Does the team meet periodically to review the progress of students taking part in interventions to determine whether those interventions are successful? What are the criteria you use to determine success? These are all hard questions, but they can help you with the bottom line. And that bottom line is working toward student achievement through the diligent planning and implementation of effective interventions. An intervention can only be successful when done with rigor and fidelity, and when it is supported by close examination of assessment data and teaching practices. 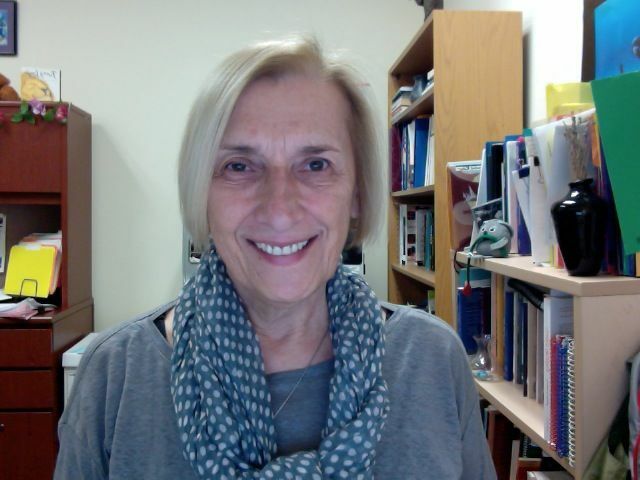 Working for the Center in the capacity of project manager, I theoretically am aware of the amazing work and systems our director Irene Fountas and her colleague Gay Su Pinnell develop on behalf of our struggling readers. This summer/fall, I experienced first hand Leveled Literacy Intervention as a parent. Read on to learn of our journey with the LLI green system. When the summer reading list for my six-year son arrived and we were urged to read for 20 minutes each day, I was excited. Yay! Gabe and I can snuggle while I help him learn to read. Gabe has enjoyed read-aloud and bedtime stories – this will be great! Unfortunately, it was a struggle and my child was not interested at ALL in reading with me over the summer before 1st grade. When I say struggle, I mean the books that were on the summer list for beginning readers were too difficult. Gabe shut down, crossed his arms, read with no expression when he was able to decode a word, and was literally kicking his feet! As a parent, I felt defeated. What and where did I do wrong? In October, Gabe started the green Leveled Literacy Intervention (LLI) program. Immediately, he gained confidence in his reading. With each take home book, I saw his magnificent growth each day. A milestone for me was when he read to his nine-month old sister totally without prompting! During our teacher conference, his teacher shared that when asked if he was a reader in September; he stated “No, I am not good at it.” By December, Gabe’s teacher stated that if she asked that question now, she felt the response would be a much more positive one. What has changed? His experience with successful reading in LLI small group instruction (thanks to Ms. Williams) allows Gabe to fully participate in his literacy instruction in his classroom. He has learned to problem solve if he doesn’t know a word. His LLI group is wrapping up and although I haven’t seen a progress report yet, I can measure his success through his reading behaviors and development of text preference. He seeks clues, reads sentences everywhere with fluency, and is in constant exploration of language. His writing has improved through the take home activities as well. Thank you to Brookline Public Schools for understanding how important this early intervention is to your students and to the Fountas and Pinnell team for creating these systems to provide this small group instruction! 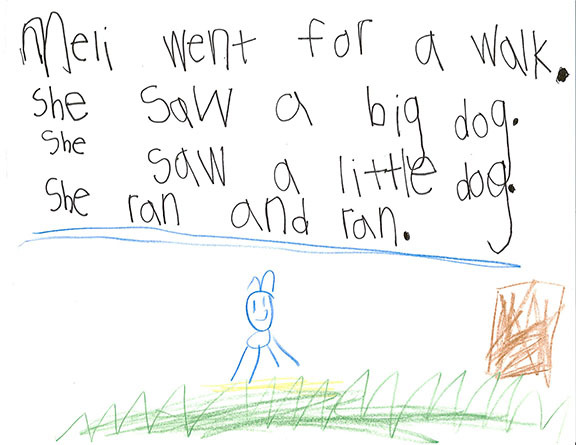 Writing about Meli from his writing book. Gabe’s favorite book series are Orsen and Taco, Meli, and Sam and Jessie.